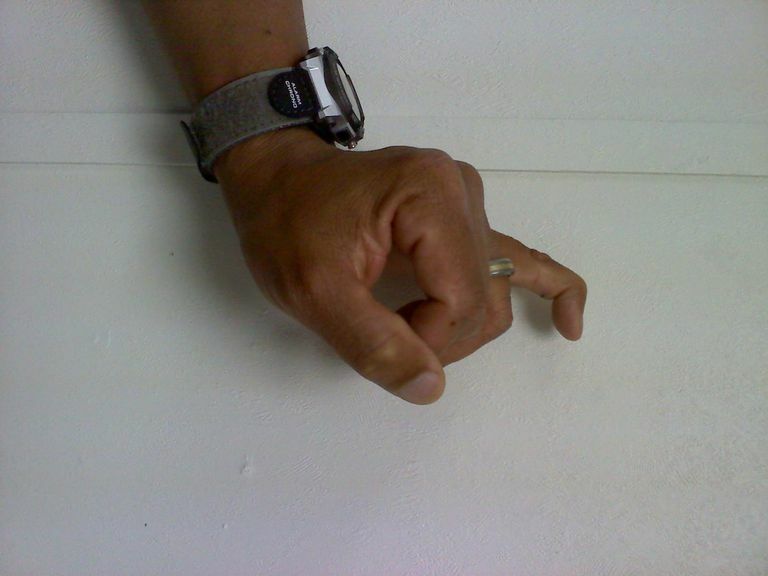 If your finger is bent at the last joint and won't straighten all the way out, there is could be several reasons why. Maybe you tried to put on a pair of gloves that were too small and once you took them off, you couldn't straighten your finger all the way. Or perhaps your bent finger is a result of getting it caught in a door. In any case, how do you determine the severity of the damage and seek treatment? A finger that won't straighten out is called a mallet finger or a mallet fracture. In most cases, the reason a finger won't straighten out is that the tendon that does the work is stretched or torn. Sometimes, it's because the bone where the tendon is attached has broken off, which is known as an avulsion fracture. Tendons are like cables attached to muscles on one end and bones on the other. When muscles contract, they pull the tendon and move the bone. It's very similar to the way hand brakes work on a bicycle or the way flight controls work on an airplane. Fingers are special because many of the muscles that move them are pretty far away, on the forearm. Some of the tendons for the fingers run past the wrist all the way to the tips. There are tendons on the palm side of each finger to make it close and tendons on the back side (dorsal) of each finger to extend it (make it straighten). If you tear or stretch the tendons on the dorsal side of the fingers, they won't properly straighten out. The bones of your fingers are called phalanges and there are three for each finger (two for each thumb). The one at the tip has only one tendon to pull it out straight. If that tendon is damaged, it won't straighten all the way (the tip will stay bent). Stretched out. The tendon is still attached but now it's too long. Torn or cut. The tendon is torn or it has been cut and now it can't pull like it's supposed to. Avulsion fracture. The tendon is all there and not necessarily stretched out, but the bone where it's supposed to be attached (called the insertion point) is broken. It is reminiscent of a picture falling down because the hook it was on ripped out of the wall. If you injure your finger and it won't straighten out within three days, you should see a doctor. If it happens at a weekend football game, you can wait until Monday, for example. This isn't something that needs to go to the emergency room unless you see blood under the fingernail or the fingernail is coming off. Blood under the nail or damage to it could indicate a severe cut or severe fracture under there. Kids especially need to see a doctor if they get a mallet fracture. In kids, the part of the bone that controls growth could be affected, which might result in a deformed finger if not treated appropriately. Continue to ice the finger a few times a day until you can get to the doctor. The doctor will likely give you a special finger splint that keeps your finger straight. If the tendon is just stretched, keeping it straight will allow it to heal. If it's torn or if the bone is fractured, your doctor may recommend surgery in order for the injury to heal correctly. How Do You Know If You Have a Broken Rib?